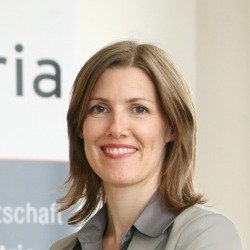 Daniela Schallert has been part of the organization since 1999. She and Manuela Vollmann share the position of the executive management as a Top Job Sharing Couple. Both are convinced: two heads, four eyes and four ears think, see and hear more than two. They are confident to be living a sustainable model for a profitable and livable economy. Besides the strategic development of the company, her areas of responsibility include the organizational development as well as the fields of quality and knowledge management. She takes managerial responsibility for the conception of labour market activities as well as transnational projects. Her expertise encompasses labour market policies, gender mainstreaming and diversity management as well as gender equality, education and women in top positions.